I bought a big box of guitar junk from a kid here in town. Originally I was interested in just the Fender bass neck he had listed, but he said he had other stuff, too. Yep, Craigslist. But he made good musician text jokes- "Be there in a Minuet..." Ha! Good one. Spell check would have "fixed" it, so I knew it was on purpose. I figured probably not a cannibal, just a fellow music dork. I've run into probable cannibals around here via Craigslist, so I watch it. After picking up the neck, he led me to the "big box of guitar junk". I noticed it was stacked on top of full garbage cans, hinting that I could haggle on whatever price he came up with. After handing over my lunch money, I drove off happy, and examined the haul at home. Turned out to be pieces enough for 11 complete guitars and basses, plus extra necks. 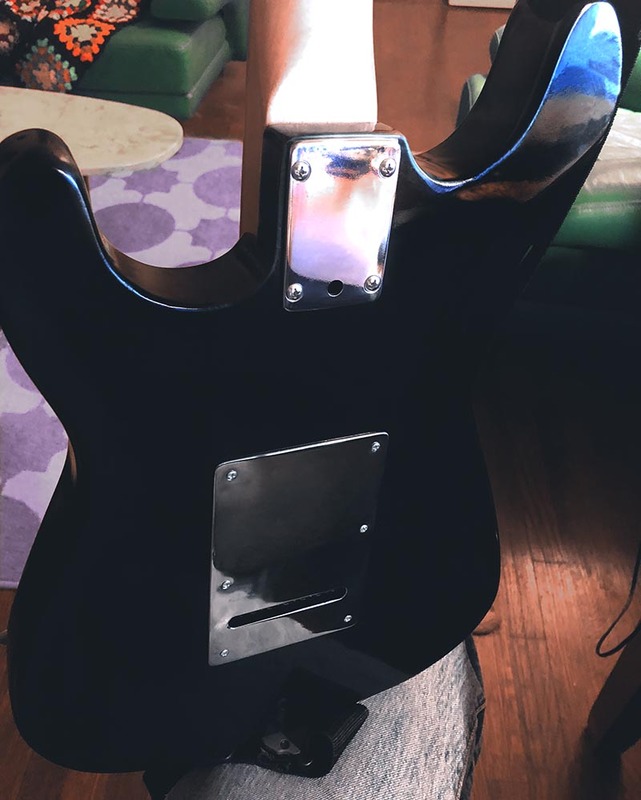 Fortunately, the neck was untouched, and had the original tuners. 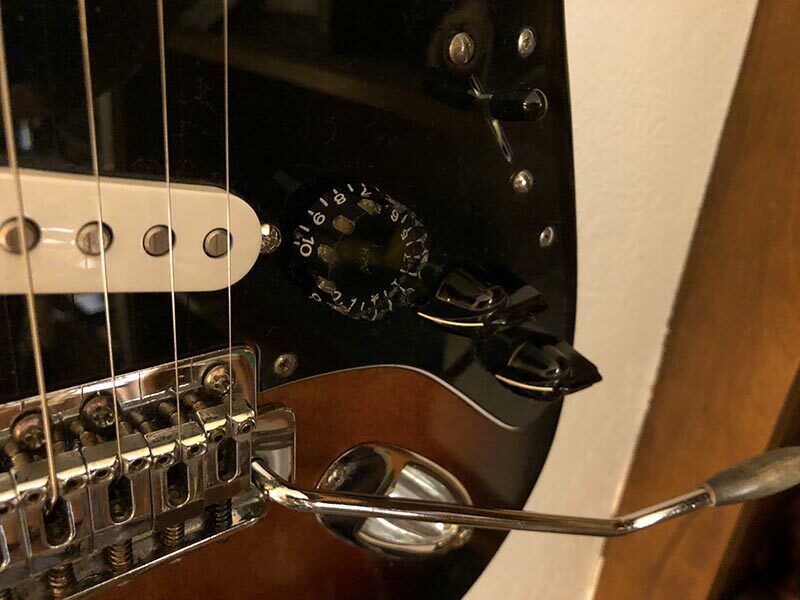 Spare Strat pickguard fits fine. 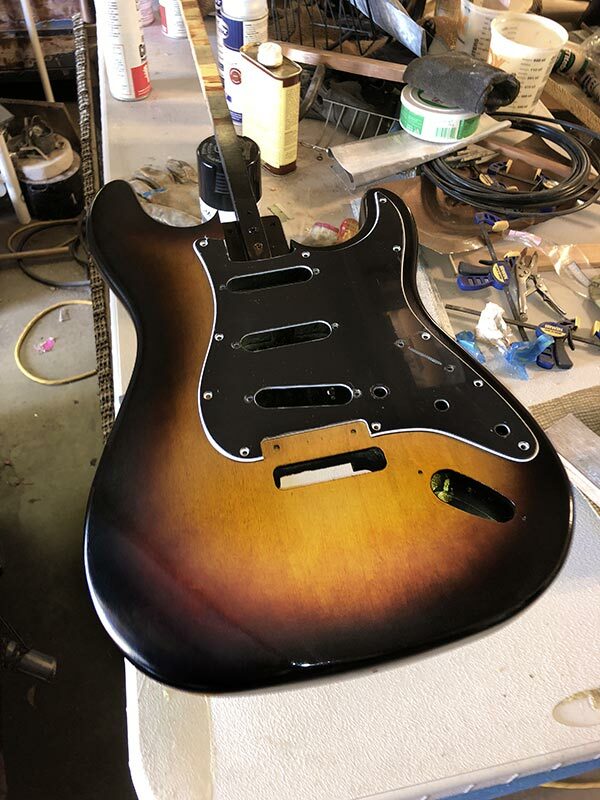 I gave it a nice black/tobacco burst finish in nitro lacquer. This turned out to be an issue. 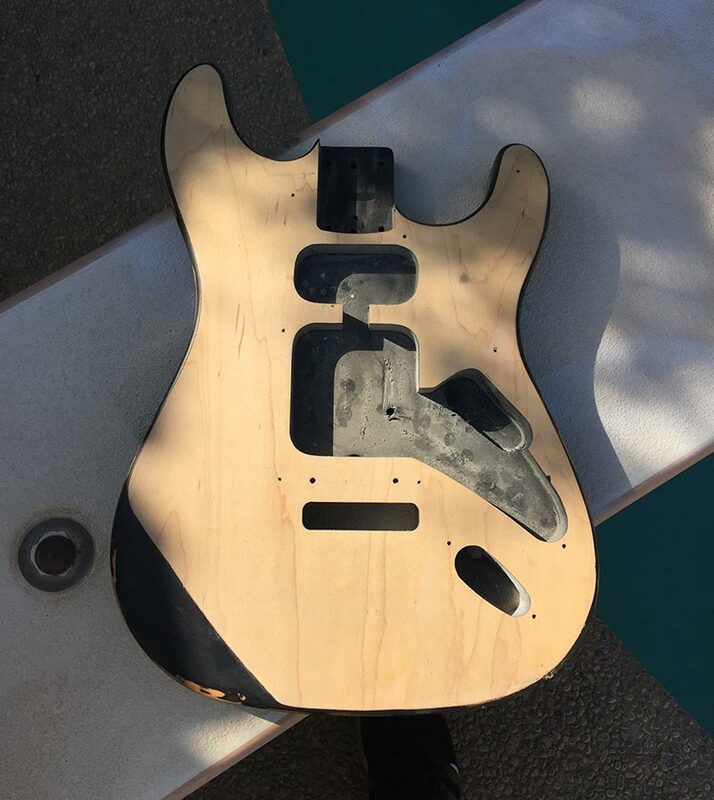 The was body contaminated with silicone (yeah, ArmorAll, or something that made the lacquer react with craters), and I had the strip off the first coat of sealer. It had craters ALL OVER the body. I sanded back to wood, wiped it down with lacquer thinner, and did 3 light mist coats of shellac, then 3 sanding sealer mist coats, then a mist coat of clear. And... there were still pits and craters. I drop filled the craters with shellac, sanded smooth and applied the clear, burst colors and then several clear coats. 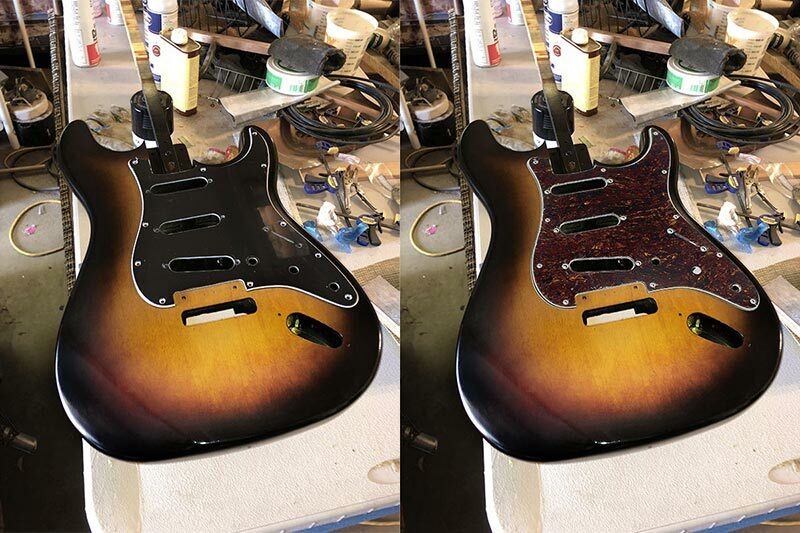 There were STILL a couple fisheyes, but I decided to call it "good enough" and drop fill what I could, do a 2000 grit finish sand and then buff it out. I'm guessing the rest of the bodies in the big box are similarly contaminated. Fudge. I didn't have any neck plates or trem covers on hand, but I have a scrap bucket of assorted steel pieces! Neck plate is .125" steel, Drilled, counter sunk, polished. I didn't forget to drill the access hole for micro-tilt adjustment screw. The trem cover is about .062", drilled, countersunk, and polished. I cut a slot intead of individual string holes. Lining up six holes in a perfect row never works out... The steel trem cover is forever, unlike every soon to be broken plastic trem cover I've seen. No Strat knobs handy, but I have a bag of Gibson speedy knobs and a bag of old chicken heads. Good enough. In my personal box of guitar junk, I also happened to have a 4 hole (Peavey probably) bridge/trem. Trem arm was naked so I made wood knob for it. Pickups were leftovers from a brand spanking 2018 Fender Player Series MIM Strat that I converted to lipsticks for a friend. Inside- CTS A250k pots, Sprague Orange drop at .047uf, pushback wire, and vintage wiring (tone on the output, alà 50's Gibson). On the wall, all done. 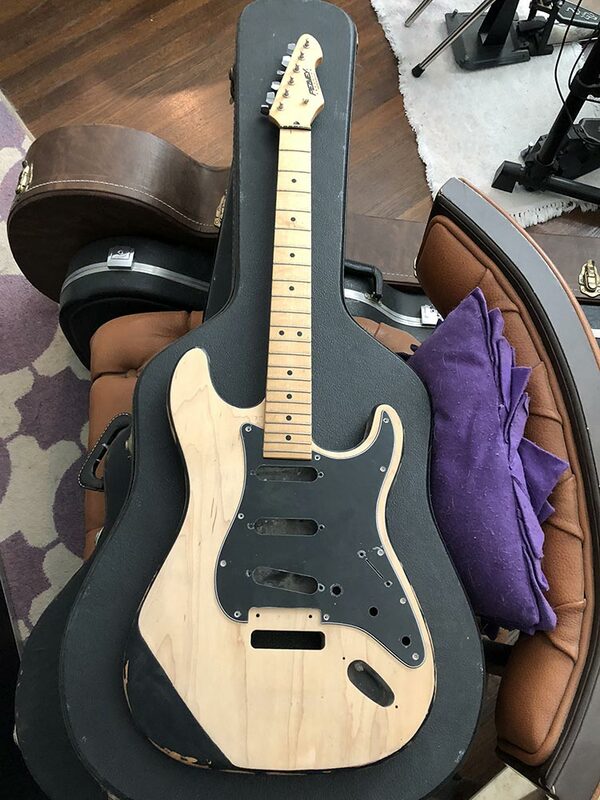 100% parts on hand plus the the initial cost of the whole big box of guitar junk, divided by the 11 "whole guitars", makes the cash investment into this one, including new strings (10, 13, 15, 26, 32, 42), about $10. It plays and sounds really, really nice.